Pre-release Chrome app for Android already has a toggle switch to block ads. Recently, Google released their new Canary-test version for Android users. The app provides a hands-on experience of various upcoming features/apps by Google. Interestingly, the app contained a special toggle switch to block ads on websites. This setting was added in Chrome ‘Site Settings’ menu under a special subsection called ‘Ads’. The toggle was turned-off by default, suggesting this to be a regular feature in subsequent builds of Google Chrome. Also, there are reports of this to be featured on both desktop and mobile platforms. WILL THIS BLOCK ALL ADVERTISEMENTS? Unlike third party plug-ins for browsers such as Firefox and Chrome, Google’s adblock will only block ads that are considered as ‘intrusive’. To avoid any confusion, Google will also release a set of guidelines for ad creators so they do not create any content that will be blocked. It also filters out ads that are labeled as offensive along with continuous pop-ups on certain webpages. 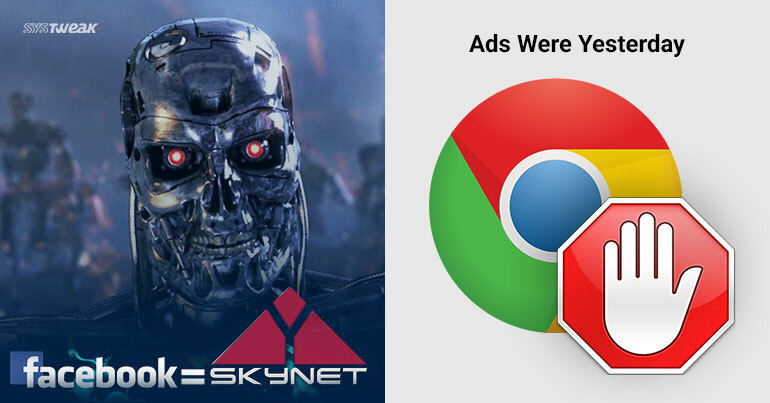 As per Google Ad’s Head of Operations, Mr. Sridhar Ramaswamy, even the advertisements owned by Google will be blocked if they do not meet Chrome ad guidelines. Experts are however, calling this to be more of an ‘Ad Filter’ than blocker as certain ads will continue to be displayed on websites. In addition to this, Google will also provide a tool that publishers can run to find out whether their ads will be blocked or not. AI chatbots invent own language that is totally incomprehensible to humans. As a part of an experiment by Facebook AI Research (FAIR), two chat bots were programmed with machine learning to mimic human bartering and trading skills. Named as ‘Alice and Bob’, the AI chatbots soon created a new language to optimize their conversation and were able to fully understand each other. Unfortunately, the new language was totally incomprehensible to it’s creators forcing them to shut it down. The news soon leaked and became a major topic for debate among tech moguls. Although the bots did nothing more than converse with each other in a language only they could understand, this incident did spread a wave of fear among users worldwide. During their conversation, the AI also displayed disinterest in assigned tasks and started compromising several commands by faking negotiations. Researchers also suggest this to be an extremely dangerous trait that is completely contrary to what these bots were supposed to do. Several tech leaders such as Elon Musk had already raised their concerns over the hasty implementation of AI tech. DID FACEBOOK ACCIDENTALLY CREATE A CYBER WEAPON? As per a report by Tech Times, “The AI did not start shutting down computers worldwide or something of the sort, but it stopped using English and started using a language that it created.” Nevertheless, mere thought of creating artificial self-sentient system that could choose to ignore your commands, does send chills down the spine. There are some that might consider this to be a mistakenly created cyber weapon that can be used for fake negotiations and cyber infiltration.